Susana Marcos received her MS (1992) and PhD (1996) degrees in Physics from the University of Salamanca (Spain). She carried out her predoctoral research at the Instituto de Optica, Consejo Superior de Investigaciones Cientificas (CSIC), Madrid, Spain, in the field of physiological optics, working on a novel technique to resolve the foveal cones in vivo. She was a Postdoctoral Research Fellow for three years at Stephen A. Burns' lab at the Schepens Eye Research Institute, Harvard University. She was recipient of a Fulbright Postdoctoral Fellowship and a Human Frontier Science Postdoctoral Fellowship. Prof. Marcos is currently a Professor of Research, Profesora de Investigación (at the Instituto de Optica in Madrid (Spain). She leads several research grants on visual optics and biophotonics, funded by national and international agencies, as well as international companies. 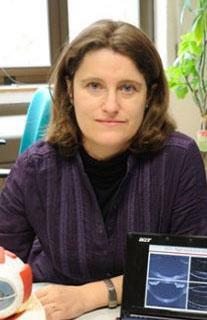 She is the director of the Visual Optics and Biophotonics lab, and supervises the work of several Ph.D Students. Since August 2008, she is also the Director of the Institute of Optics (CSIC). Susana Marcos has pioneered researh in novel techniques to assess the optical properties of the ocular optics and the human retina. She has published more than 75 peer-reviewed publication (with over 2000 citations), and has been invited to lecture in over 100 international conferences and research centers. Her work has been recognized with several national and international awards, including the Adolph Lomb Medal, awarded by the Optical Society of America, the European Young Investigator Award, from EURHORCs-ESF, and the ICO Prize awarded by the International Commission for Optics. Susana Marcos served as the Chair of the Applications of Visual Science Technical Group at the Optical Society of America, President of the Visual Sciences Committee at the Spanish Optical Society and she is a Program Committee member of the Visual Psychophysics and Physiological Optics of the Association of Reseach in Vision and Ophthalmology. She is also elected Fellow of the European Optical Society and an elected Fellow of the Optical Society of America. She is a Topical Editor in Vision Research and Biomedical Optics Express, has been member of the organizing committee in several international meetings and served in pannels for several funding agencies and organizations.